Can a Chiropractor Help with Sports Injuries in Kids and Teens? Professional athletes know the many advantages of chiropractic care and massage as a method of both relieving and preventing chronic back and neck pain from sports-related injuries. Unfortunately, children and teenagers are just as prone to the sprains and strains that can easily result from leading an active and healthy lifestyle. Recovery through traditional methods can take months, but a reputable Chiropractor can often offer much faster healing through a variety of drug-free rehabilitation services. While many of these teenage sports injuries are very common, most can be easily prevented by wearing the proper safety gear. Warming up properly before engaging in the activity is also an important preventative measure. If an injury happens to occur, contact Goyke Health Center. 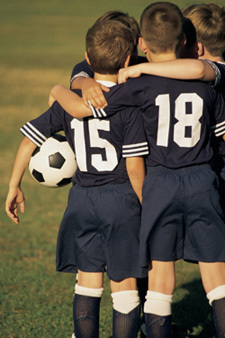 We specialize in progressive chiropractic treatments for children and teenagers suffering from sports-related injuries.